I think everyone knows how to make pizza. I’m sure everyone loves to eat pizza, especially children. 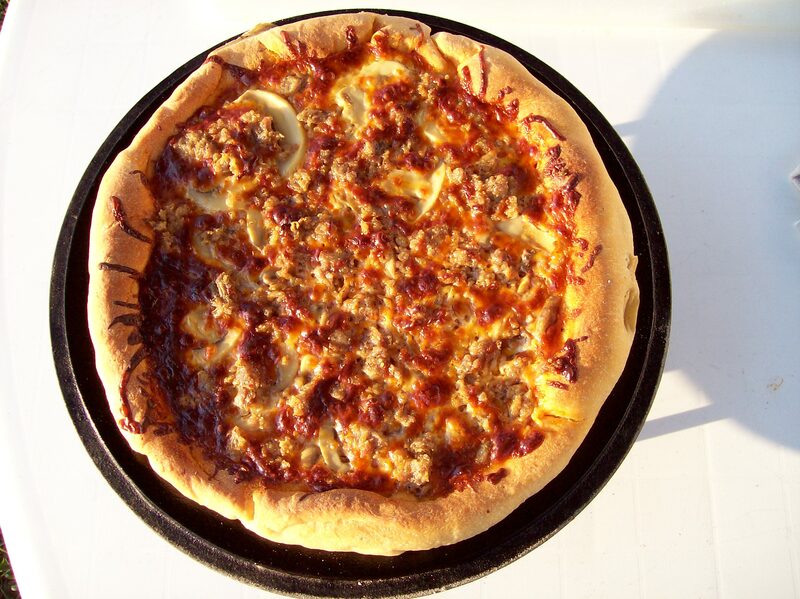 Why not have pizza during your next camping trip or backyard cook out. This is the simple recipe for pizza, everything is store bought. If you’re a Seasoned Dutch Oven Pro or Baker, then use your favorite pizza crust. Bellpeppers, Mushroom and Onion, etc. Add your favorite toppings, the combinations are endless. 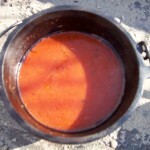 I prepared the sauce and simmered it in my 5″ Baby Dutch Oven for about 20 minutes. 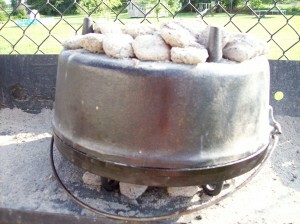 Put two briquettes on the bottom and three on top. Lightly oil the lid or apply corn meal so the pizza won’t stick. Assembly pizza right on the lid and place on a lid rack. Take a 12″ Dutch Oven and flip it over setting it on the lid. Add charcoals and bake. Use welders gloves to handle the Dutch Oven. 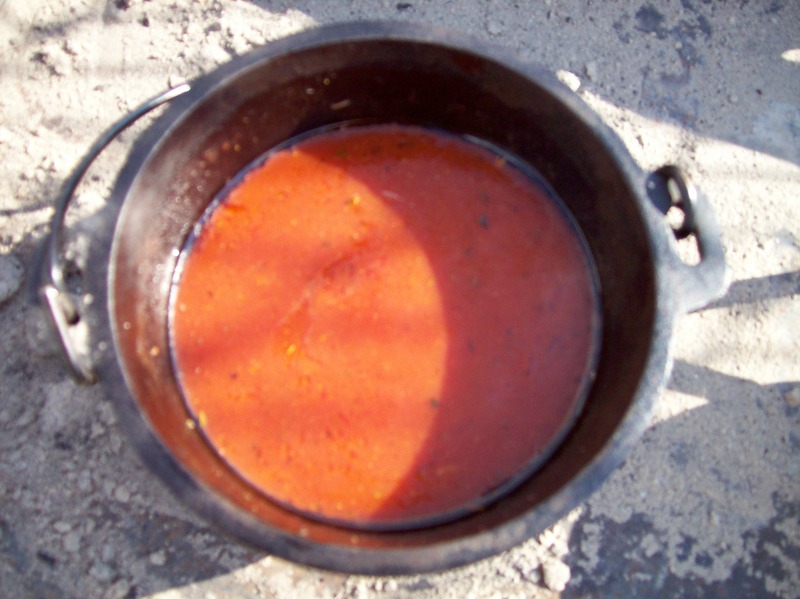 Be careful, the Dutch Oven is Heavy and HOT! I don’t remember how many coals I used, but it was a lot. I put an even layer down and loaded the top. Baked it for about 40 minutes. 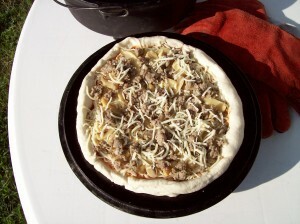 In your kitchen oven a pizza wil cook at 425 for 15 minutes, using a Dutch Oven this way gives you about 325 to 350 degrees. It also depends on the wind and outdoor temperature. 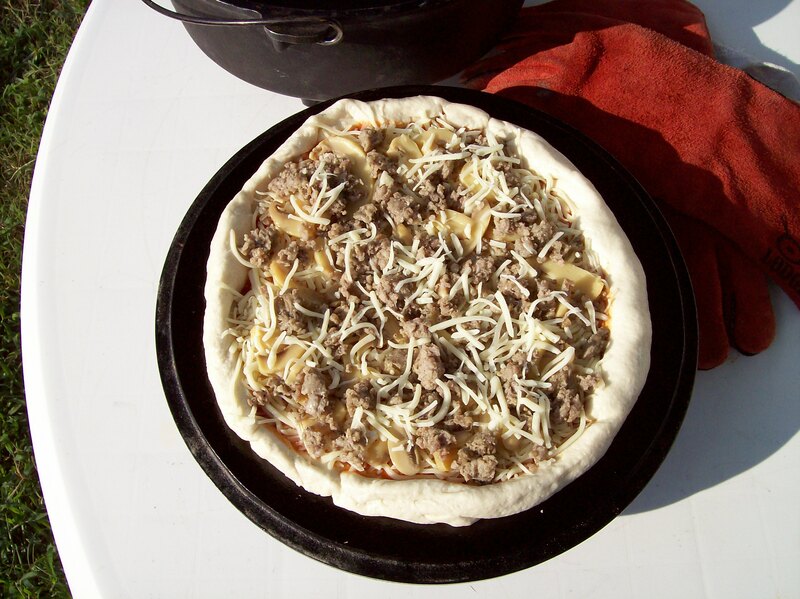 Give it a try, it’s fun to have pizza on a camping trip.